In the Lower Cook Inlet Management area, saltwater king salmon fishing occurs year-round the nearshore waters of Kachemak Bay and east Cook Inlet. The sport fishery targets a mixture of Chinook salmon stocks. Mature (spawning) king salmon are caught April through August in the summer fishery while "feeder" (immature) king salmon are caught year-round. After ADF&G developed a king salmon genetic baseline, stock-specific harvest of king salmon in the Cook Inlet saltwater fishery was estimated and provided in the Report to the Alaska Board of Fisheries: Progress report on genetic and coded wire tag mixed stock analysis of Chinook salmon harvested in Cook Inlet marine sport fishery, 2014—2016. This small troll fishery is primarily accessed by boat from the Homer or Seldovia harbors. Although feeder king salmon are present year-round, spring and fall are typically when anglers are most successful. Most anglers use downriggers and troll herring or lures behind flashers in water up to 100 feet deep. Feeder king salmon are caught along the south shore of Kachemak Bay from Point Pogibshi east to Chugachik Island and the shoreline from Homer north to Anchor Point. From April through August, when spawner king salmon are returning Cook Inlet streams, anglers often target them in the Cook Inlet waters from Bluff Point north to Deep Creek. Access to the area occurs from private tractor launches at Deep Creek and Anchor Point, the Homer harbor, and some anglers launch small skiffs from the beach at Whiskey Gulch. Anglers find their best success fishing close to shore in waters less than 40 feet deep. Most anglers still use downriggers but divers or trolling sinkers are also effective. Herring or lures fished with flashers or dodgers have also proven successful. Additional spawner king salmon are available at one of the three king salmon enhancement fisheries in Kachemak Bay. See the Enhanced Fisheries Tab above for more information. 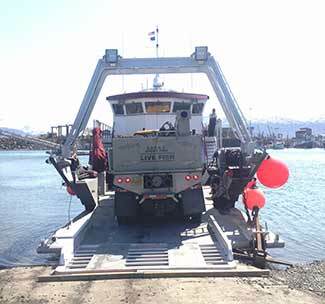 King and silver salmon are stocked at terminal locations in Kachemak Bay to provide additional angling opportunities. Each of the following three enhanced locations provides unique fishing opportunities. Fishing for king salmon starts in mid-May, peaks in mid-June and ends by July. Silver salmon fishing occurs from about mid-July through mid-August. Learn more about the Statewide Stocking Plan. 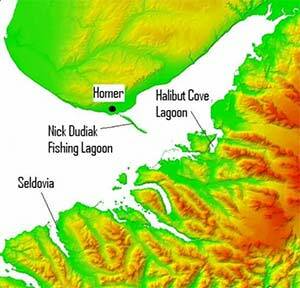 The Nick Dudiak Fishing Lagoon (alias The Fishing Hole) is located on the Homer Spit and has both king and silver salmon. Anglers fish the Nick Dudiak Fishing Lagoon from shore along the inside of the lagoon or just outside the entrance. The best time to fish inside of the lagoon is during an incoming tide greater than 12 feet, when the water is flowing like a river into the lagoon. Anglers tend to fish outside the lagoon during the outgoing tide. Successful fishing techniques used include casting with lures, salmon-egg clusters, shrimp, and cut herring. Fishing eggs or herring beneath a bobber can be effective at slack water. Snagging fish in this fishery is not allowed, except by emergency order. Each year a youth-only fishing area is established for persons 15 years of age or younger on the first Saturday in June and first Saturday in August. 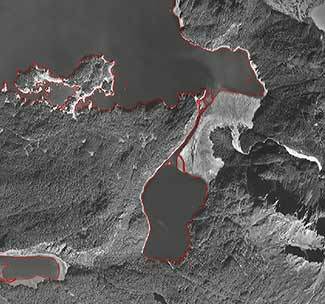 The Seldovia Lagoon is located in the small community of Seldovia and is enhanced with king salmon.Seldovia is accessed by plane, ferry, or boat. 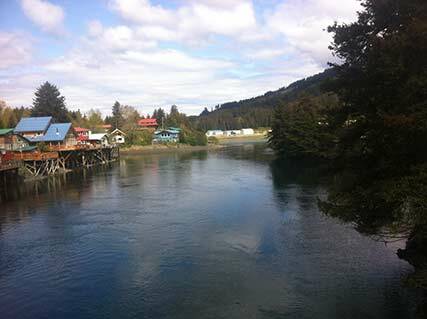 Once in Seldovia, anglers use the Slough Access road to reach the lagoon or use a small skiff from the nearby harbor. Early in the run, anglers troll near the mouth of the lagoon during high tide. Successful fishing techniques include casting with lures, salmon-egg clusters, shrimp, and cut herring. Snagging is prohibited through June 23. Halibut Cove Lagoon is located southeast of the Homer Spit and is enhanced with king salmon. Anglers access Halibut Cove Lagoon by private boats or water taxi through a narrow, rocky channel on tide heights greater than 10 feet. Most of the fishing occurs along the southern shoreline near the state park boat dock. Anglers fish from the dock, or boats. Anglers find the best success by first spotting a school of salmon swimming along the shoreline and then casting lures in front of them. Boat anglers will also have some success trolling in the early part of the season. Snagging is prohibited through June 23. While sport fishing for Pacific halibut may occur February 1 through December 31 annually, most sport harvest occurs between May and early September when weather conditions are fairer. This marine fishery can be accessed out of the Homer Harbor, or the Anchor Point or Deep Creek tractor launch facilities. As rough seas can develop quickly in this area, only anglers with appropriate vessels and open-water experience should venture out. For those lacking in either, numerous charter boats operate out of all three areas. Homer is the self-proclaimed halibut capital of the world, and more sport-caught halibut have traditionally been landed in the Lower Cook Inlet ports of in Homer, Anchor Point and Deep Creek/Ninilchik, than the remainder of Southcentral Alaska combined. Look for fish concentrations at depths of 50 to 200 feet, near underwater structures such as drop-offs, pinnacles, and kelp beds. Herring is easily the most popular bait, but octopus, squid, salmon heads, weighted jigs, and combinations of these items work well. Since larger halibut (50 - 300 lbs) are common, use a stout rod loaded with 80- to 100-pound test line. Strong currents may require heavier weights (12 to 32 oz) to keep the bait on the bottom during tidal ebbs and flows so many anglers choose to fish during slack tide in order to use lighter weights. Learn more about halibut. The lingcod fishery occurs primarily along the outer coast around the Chugach Islands and around the Barren Islands, accessible through the Homer Harbor, or the Anchor Point or Deep Creek tractor launch facilities via charter or personal fishing vessels. Harvest of Lingcod is restricted to fish 35 inches or longer. These adult lingcod can be found near steep rocky banks or over rocky structure by anglers jigging for halibut. Learn more about Lingcod. Lingcod spawn December through March and males of the species fiercely guard the nests through June to prevent other fish and shellfish from eating the eggs, making them more vulnerable to harvest during this time. Therefore, lingcod are available for sport harvest from July 1 through December 31. Rockfish are often caught along the outer coast while lingcod fishing, jigging for halibut, or even while trolling for king salmon in Cook Inlet around kelp beds west of Seldovia or near Bluff Point. Rockfish may be kept year-round. Be aware of bag and possession limits which differ for the pelagic and non-pelagic varieties. If you catch a rockfish you are unable to retain, recent research shows that survival of these fish can be improved if the fish are released at the depth they were captured. Get more information on rockfish and deepwater release devices. 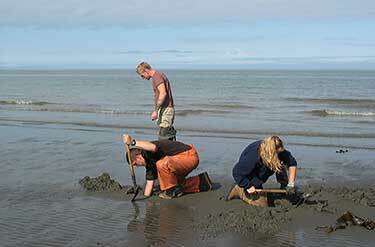 Clam digging for both razor and hardshell clams is popular in the Lower Cook Inlet Management Area. Clams live in the intertidal zone of the shore so digging occurs year round during minus low tides. Most clammers dig clams from May through August when large minus tides occur during the day. Equipment needed is a shovel, rake or manually operated clam gun and a container for clams. Pacific razor clams are found in exposed fine to medium grain sandy beaches along Cook Inlet beaches. 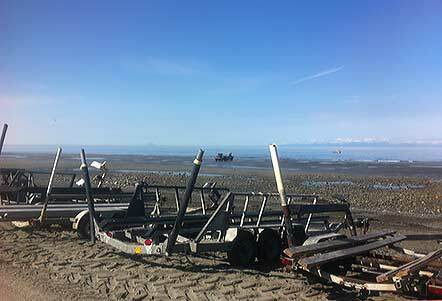 Cook Inlet supports popular sport and personal use razor clam fisheries. 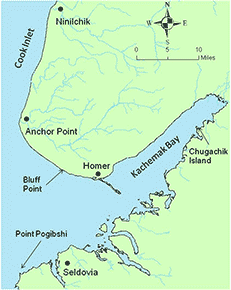 The remote beaches on the west side of Cook Inlet are accessible by boat or plane and the east side beaches are accessed from the road system. In 2015 the fishery closed from the Kenai River south to the tip of the Homer Spit and remains closed at this time due to low populations of clams. Learn more about Cook Inlet razor clams (PDF 796 kB). 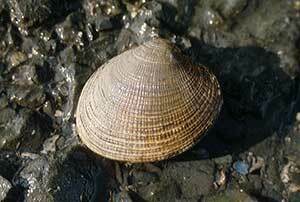 Hardshell clams are found along the southern shore of Kachemak Bay from Bear Cove to Jakolof Bay. Access is by boat or water taxi. 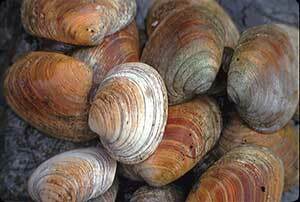 The most commonly harvested types of hardshell clams are Pacific littleneck (steamer) and butter clams. Blue mussels and cockles are also available. The islands in China Poot are popular with clammers looking for butter clams. Littleneck clams are found in most sub bays such as Jakolof and Tutka Bays, Sadie and Bear Coves. 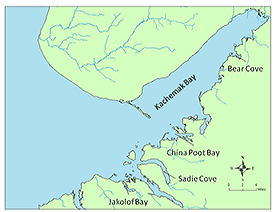 Learn more about Kachemak Bay hardshell clams (PDF 2,263 kB). Tanner crab live on the seafloor down to about 1,500 feet and anglers use pots to capture them. Most anglers lower a heavily baited crab pot down into 300-500 feet of water. Some anglers set their pot over night and others set their pot at the start of the day before going out fishing and retrieve the pot when returning. To avoid tangling gear, be careful to avoid setting pots around other gear, which should be marked by a buoy. Harvest of Tanner crab is restricted to males whose carapace width is 4.5" or longer from side to side. In order to grow, a Tanner crab must molt. Some Tanner crab stop growing (terminal molt) and their shells darken and some may have barnacles growing on them. Often times, these terminal molt Tanner crab contain a higher yield of meat than those who have recently molted. In the Lower Cook Inlet management area, opportunities to fish for salmon and trout are found in four road accessible streams (Ninilchik and Anchor Rivers, Deep and Stariski Creeks). These streams are small coastal streams the feed into Cook Inlet. Sport fishing for king and coho salmon, steelhead trout and Dolly Varden are the most popular. 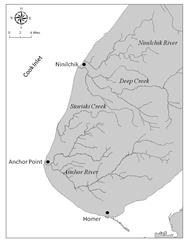 The Ninilchik River and Deep Creek are located in the town of Ninilchik; Stariski Creek and the Anchor River are approximately located near Anchor Point. The Sterling Highway provides access to all four streams. Salmon fishing is only allowed in these streams from the mouth upstream approximately two miles and Stariski Creek is closed to king salmon fishing. Fishing for Steelhead trout and Dolly Varden upstream of the two mile marker is allowed from August 1 through October 31. These streams are closed from November 1 through June 30 except for a few weekends in late May and June. Anglers are reminded that when fishing in all area streams there are several regulation prohibiting anglers from removing a fish from the water. King salmon, rainbow and steelhead trout, and silver salmon 16" or larger may not be removed from the water. As always, anglers should always practice good release methods for fish released. King salmon fishing occurs in late May and throughout June. Consult the sport fishing regulation summary and look for emergency orders for days in which the Lower Cook Inlet management area streams are open for fishing. 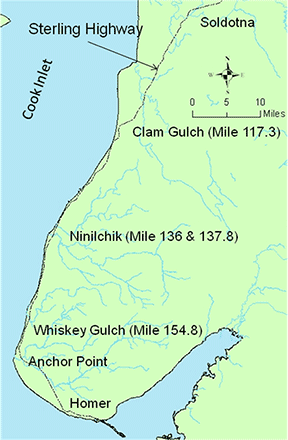 Typically the Ninilchik fishes better earlier in the season than Deep Creek and the Anchor River. Of these streams, the Anchor River has the largest run of king salmon. The Ninilchik River is also supplemented with hatchery king salmon and provides additional sport fishing opportunities. Best fishing occurs in the early morning hours or at the mouth during the incoming tide. The king salmon in these streams can be fairly aggressive and successful anglers use a variety of bait and gear to catch their king salmon. Salmon roe clusters drifted along the bottom is the most effective. Fly fishing is also popular. At times steelhead trout heading back out to the ocean may be caught by anglers targeting king salmon. Learn more about king salmon. Silver salmon start entering Lower Cook Inlet management area streams in early August and peak sometime in late August or early September. Larger numbers of silver salmon will enter these streams when flows increase from rain. Similar to king salmon fishing, the best fishing occurs in the early morning hours or at the mouth on the incoming tide. Bait such as salmon roe clusters or small troll herring drifted along the bottom are the most effective. While fishing for silver salmon there may be a small number of steelhead trout present in these streams. 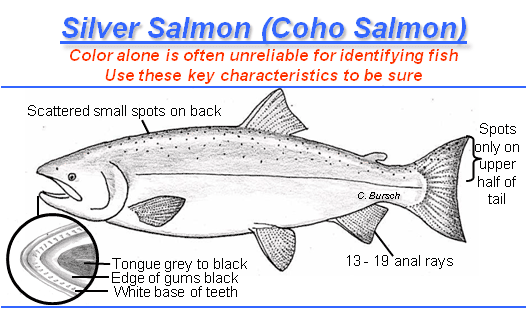 Anglers are required to be able to identify the difference between steelhead trout and silver salmon. Learn more about silver salmon. The Lower Cook Inlet management area streams provide a unique opportunity to fish for steelhead trout in September and October. Steelhead trout begin entering these streams in August and peaks in late September. Fishing can be good all the way to the close of the season, though fall rains can periodically make the river unfishable due to the turbidity. The Anchor River is the most popular and has multiple access locations for the section along the Sterling Highway. Most anglers fly fish by drifting egg patterns or swinging streamers though spinners, yarn, and jig and bobbers are effective too. Steelhead trout fishing is catch and release only; all steelhead trout may not be removed from the water and must be released unharmed. 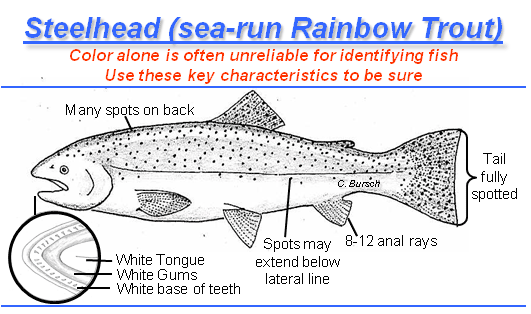 Learn more about steelhead trout (PDF 40 kB). Dolly Varden fishing in the Lower Cook Inlet management area streams starts in July with good fishing in the lower stream sections in late July. Fishing for Dolly Varden upstream of the two mile stream marker can be good from the opening in August through October when it closes. Anglers targeting steelhead trout commonly catch Dolly Varden. Fly and spinning tackle are both effective at catching Dolly Varden. Fly fisherman use a variety of fly patterns including egg imitations, smolt patterns, and small streamers. Spinners and small spoons will catch plenty of Dolly Varden in these streams. Learn more about Dolly Varden (PDF 99 kB). 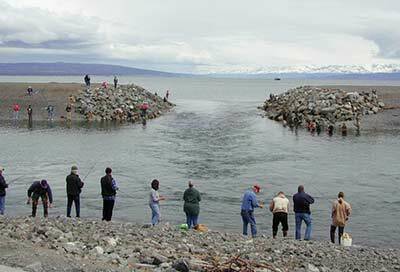 Besides king and silver salmon, the Lower Cook Inlet management area streams will have a small run of pink salmon and a few sockeye and chum salmon. Pink salmon start entering these streams in early to mid July and can be caught on small to medium sized spinners, spoons, and flies. Sockeye and chum salmon are sometimes caught while fishing for Dolly Varden or pink salmon but are rarely targeted in these streams. 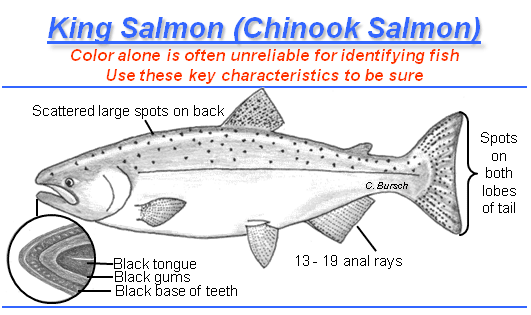 Learn more about pink salmon, chum salmon, and sockeye salmon.